This Ozark hideaway is a modernist architectural masterpiece that has been carefully sculpted onto a waterfront bluff. UNOBSTRUCTED VIEWS MAKE THIS ONE OF THE MOST BREATHTAKING LAKE SETTINGS IN THE COUNTRY. 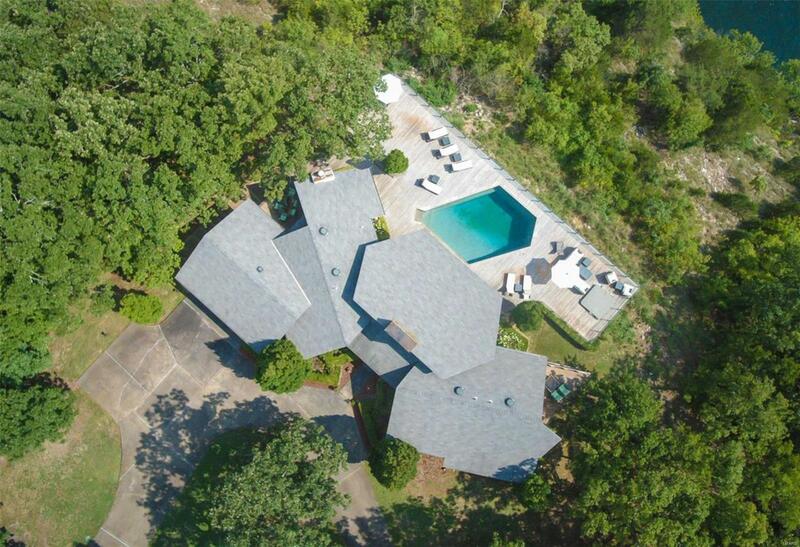 LAVISHLY REMODELED AND UPGRADED IN 2009, THIS 4,469 SQUARE FOOT HOME ON 1.5 FORESTED ACRES OFFERS A VISTA OF THE LAKE OF THE OZARKS THROUGH FLOOR TO CEILING WINDOWS FROM THE LIVING ROOM, KITCHEN AND MASTER BEDROOM SUITE. THE 30 FOOT LAKE VIEW ROOM HAS A SPECTACULAR FIREPLACE OF ITALIAN TRAVERTINE TILES. THE LARGE CHEFS KITCHEN HAS HIGHLY UPGRADED APPLIANCES AND FIXTURES ALONG WITH AN ADJACENT DECK FOR MORNING COFFEE OR AN AFTERNOON GLASS OF WINE. A LARGE MASTER BEDROOM SUITE HAS FLOOR TO CEILING WINDOWS FACING THE LAKE, AN ANTEROOM LOUNGE AREA AND DRESSING AREA WITH MIRRORED BUILT INS. THE MASTER BATHROOM INCLUDES A LARGE JETTED TUB, TWO WALK-IN CLOSETS, BUILT-IN CABINETS AND CONVENIENT WASHER/DRYER. THE SPACIOUS GUEST ROOMS HAVE ADJACENT FULL BATHROOMS AND ACCESS TO THE OUTSIDE.